Leto was the beautiful daughter of the Titans Coeus and Phoebe. Coeus and Phoebe in addition to being husband and wife were brother and sister. Their parents were the primordial Uranus, Heaven, and Gaea, Mother Earth. Both were known for their intellect, and Phoebe was known to have the powers of prophecy. Besides Leto, the pair had another daughter named Asteria. Before a discussion of Leto's son Apollo, it is important to mention Asteria, as she would play a role in the birth of her sister's twins. Asteria was the Titaness of falling stars and prophecies of the night. She was married to Perses, whose parents were the Titan Crius and the sea nymph Eurybia. The couple had a daughter, Hecate, but Asteria caught the eye of Zeus, king of the gods. Asteria, happy in her marriage and fearing the wrath of Zeus's wife Hera were she to mate with the god, turned herself into a quail trying to get away from him. Zeus turned himself into an eagle and pursued her further. Still not willing to submit to him, she dove into the sea. 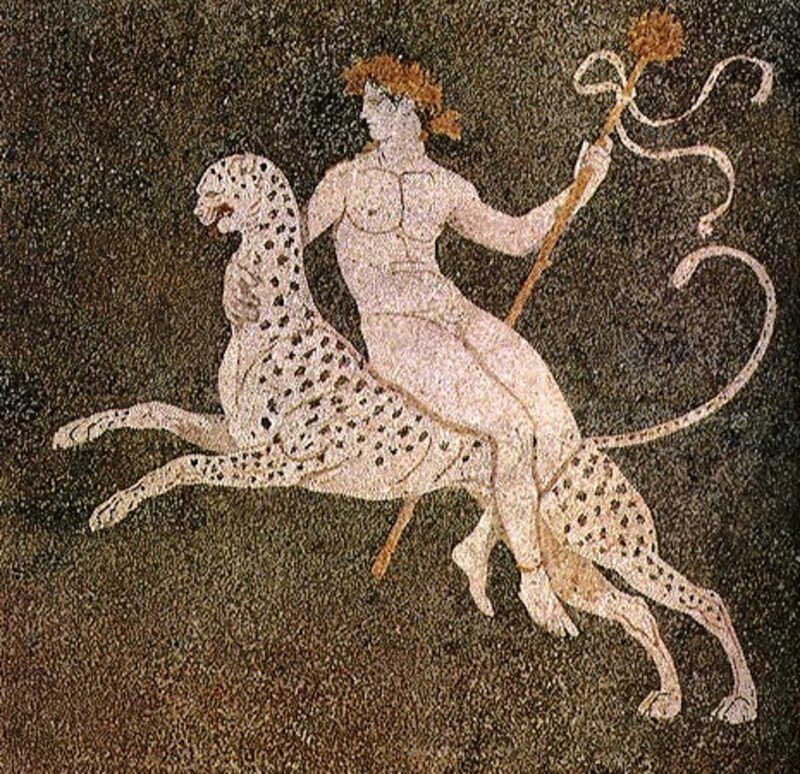 Once in the ocean, Zeus's brother Poseidon, god of the sea, spotted her and gave chase. She turned herself into an island, which earned the name Delos. When Zeus failed to have Asteria, he saw the beautiful Leto who, like many of the daughters of Titans, tried to hide herself from him. Once Zeus had is way with Leto, it was not long before Hera noticed that the Titaness was with child and knew her husband was the father. 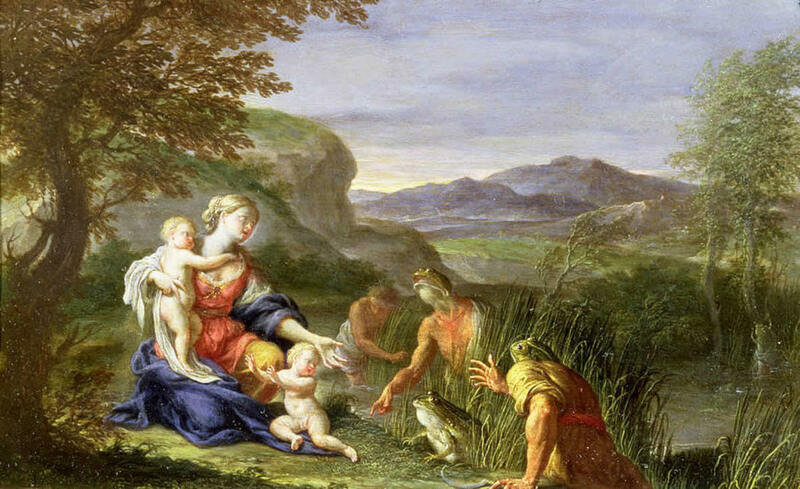 Hera, who was known to take her anger at her husband's unfaithfulness out of the other mothers and children, sent word that she would punish any mortals who allowed Leto to give birth on terra-firma, solid lands. As the time approached for Leto to give birth, she traveled from place to place begging someone to give her shelter. Every place she went, she was turned away. 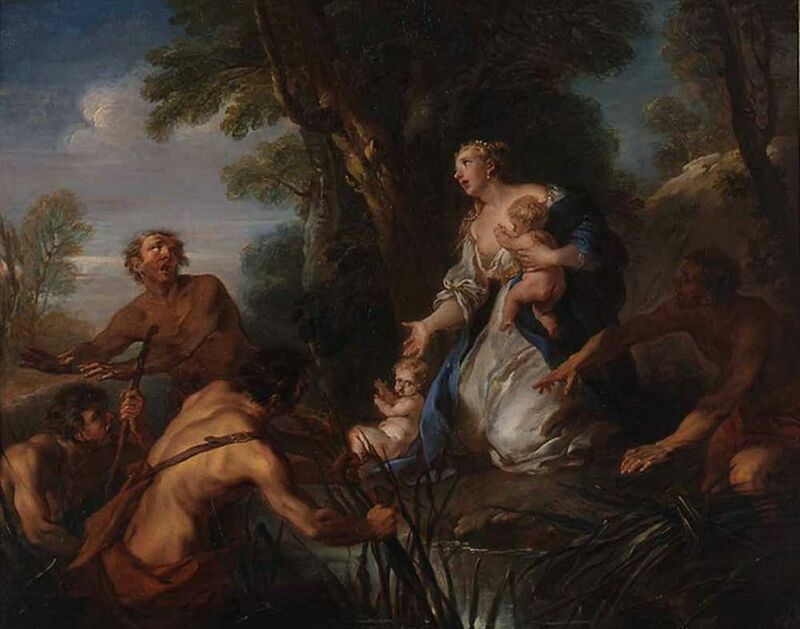 She stopped in Lycia just to take a drink of water from a pond, but the peasants there were so afraid of Hera that they took stakes and stirred up the mud from the bottom. Leto cursed the men telling that that she would turn them to frog for their insult. Once her children were born, she returned to fulfill their punishment. She finally came to the floating island of Delos. There Leto made the same request to the people of the island and promised that if they allowed her to stay and built a temple for her son, Apollo, he would honor them forever. The people agreed believing that since their island was floating, they could not be considered terra-firma. Quickly, and without pain, Artemis was born. Artemis, the twin sister of Apollo, is an archer, like her brother, and huntress and protector of animals. Like her mother, she is a protector of the young, especially girls, but her first actions upon her birth gave her another title, a goddess of childbirth. 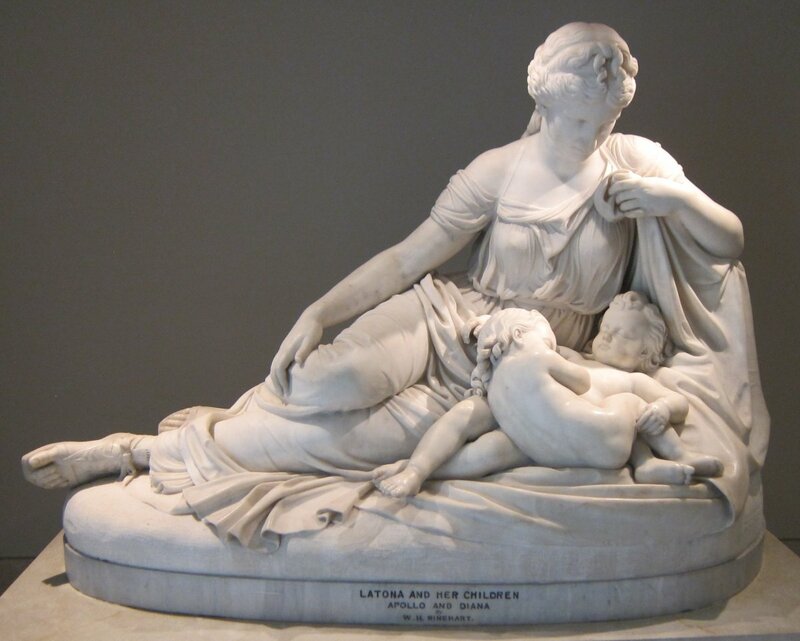 Though Leto delivered her daughter with ease, she remained in labor for nine days with Apollo. All of the other goddesses appeared at Delos to witness the birth of the twins, as was customary to confirm they were true gods. Hera, however, refused to attend the births, and she hid away her daughter, Eileithyia, who was the formal goddess of childbirth. This would not be the last time Hera would hold Eileithyia back trying to prevent a birth, as she would do the same at the birth of Heracles. The goddesses finally sent Iris, the goddess of the rainbow and messenger, to find Eileithyia. She was told to speak with Eileithyia apart from her mother, so Hera could no longer interfere. Eileithyia, upon hearing that Leto was having trouble, rushed with Iris to Delos. As soon a Eileithyia set foot on the island, Leto wrapped her arms around a tree and delivered her son. Zeus then anchored the floating island to the ocean floor so that all would be able to come honor the birthplace of his children. Being the children of Zeus, Apollo and his sister Artemis were given many gifts. Hephaestus, the god of fire and forges, presented each of them with a bow and arrows, while Phoebe, grandmother of Apollo, the current goddess of prophecy and controller of the Oracle at Delphi, gave this power to her grandson. Both of these gifts would quickly become important for the young god, for when he was four days old, he went to Delphi to claim his grandmother's gift. At Delphi, the oracle was a priestess named Pythia. She was protected by Python a son of Gaea, Mother Earth. Python was a giant serpent and the terror of Delphi. When Apollo arrived to receive his grandmother's gift, Python rose up to prevent him from reaching Pythia. The god of archery quickly drew his bow and arrow and killed the giant snake. Hera was not content with her failure to prevent Leto from giving birth. She soon enlisted another one of her husband's illegitimate sons to attack Leto. Tityos was the son of Zeus with and a woman named Elana. 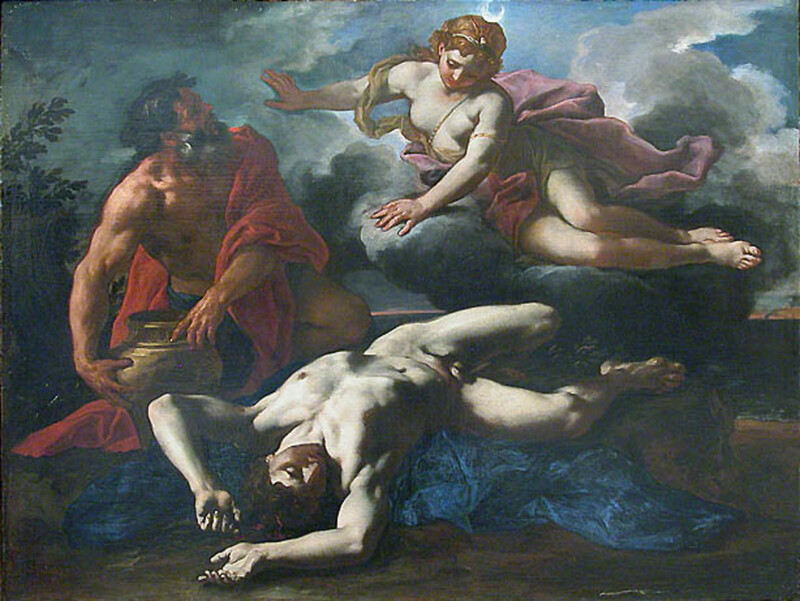 Zeus, with good reason, feared what his wife Hera would do to Elana if she discovered his lover, so he hid her deep inside the earth. The baby, Tityos, became so large that he split open his mother's womb. Gaea, protected Tityos and nursed him until he was old enough to be born. Tityos was a giant like many of Gaea's sons. After giving birth to her children, Leto was making her way to Delphi, were her son Apollo would be worshiped as the god of prophecy. Hera ordered Tityos to intercept Leto and kidnap her. After that he could do with her as he pleased. When Tityos grabbed Leto, she cried out to her children. Both Apollo and Artemis responded shooting Tityos with their arrows. 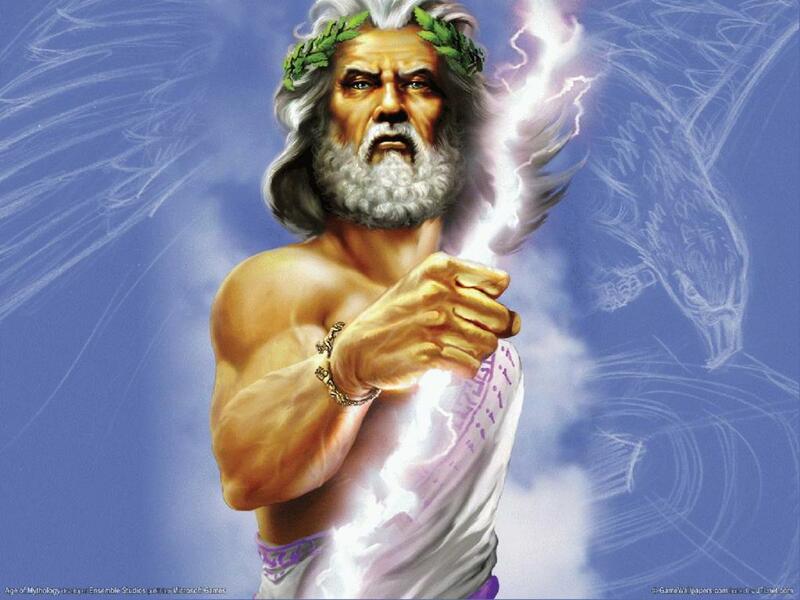 When their assault only slowed the giant down, Zeus aided them by striking Tityos with a lightning bolt killing him. Niobe, Queen of Thebes, during a celebration to honor Leto and her twins, bragged that she should be the one being honored. She was the daughter of Tantalus, a son of Zeus and King of Sipylus. Her mother was a goddess. She had given birth to seven sons and seven daughters, and her husband, Amphion, had created the great city of Thebes. Leto, not one to take insult lightly, told her children of the boast. 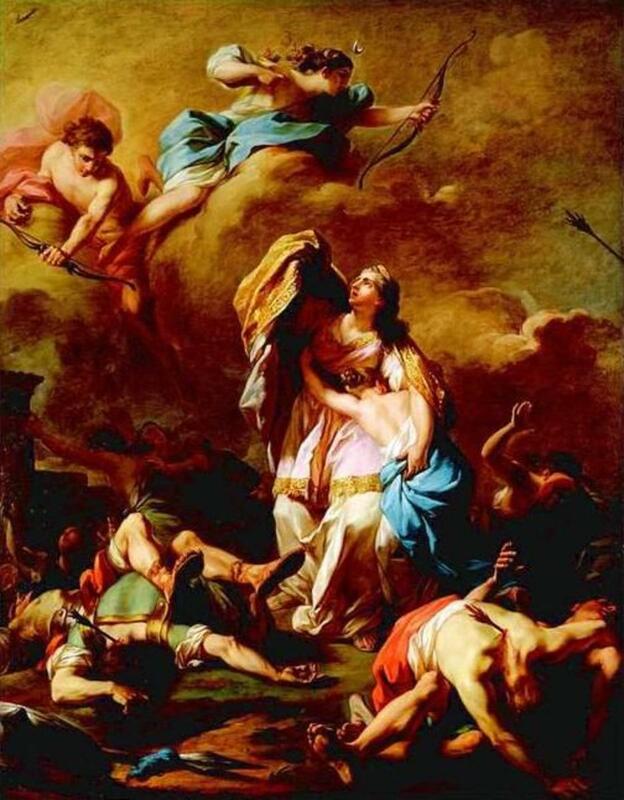 Apollo descended on Thebes and killed all seven of Niobe's sons while Artemis killed all of her daughters. Amphion, upon seeing the death of all of his children, swore revenge upon the young gods, who were also his half-brother and sister by their father Zeus. Apollo then struck him down as well. Niobe fled to her birthplace, Sipylus and prayed to her grandfather, Zeus, to end her misery. He answered her prayer by turning her to stone. 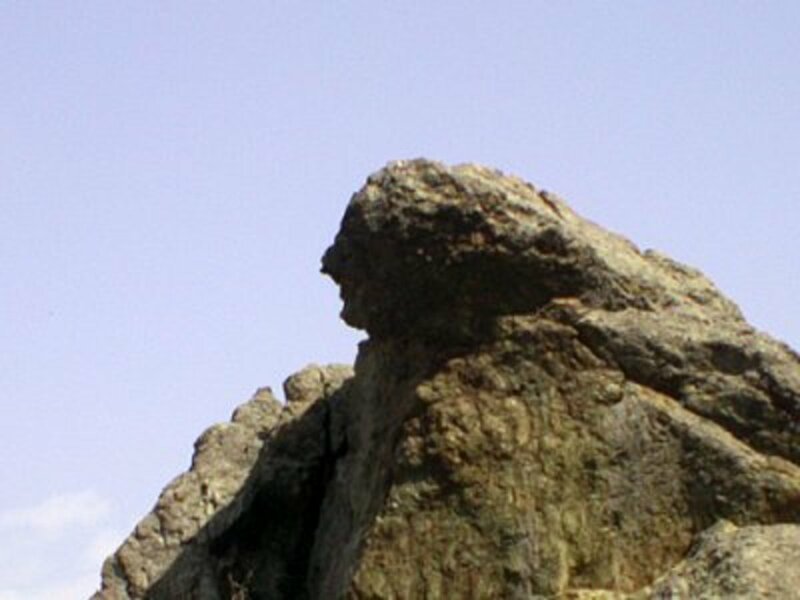 She began to weep for her children through the rock and during the summer, continues to weep today. Artemis had sworn herself to remain a virgin, but as she and her mother Leto took to hunting, they took with them a companion named Orion. Artemis and Orion soon became very close. 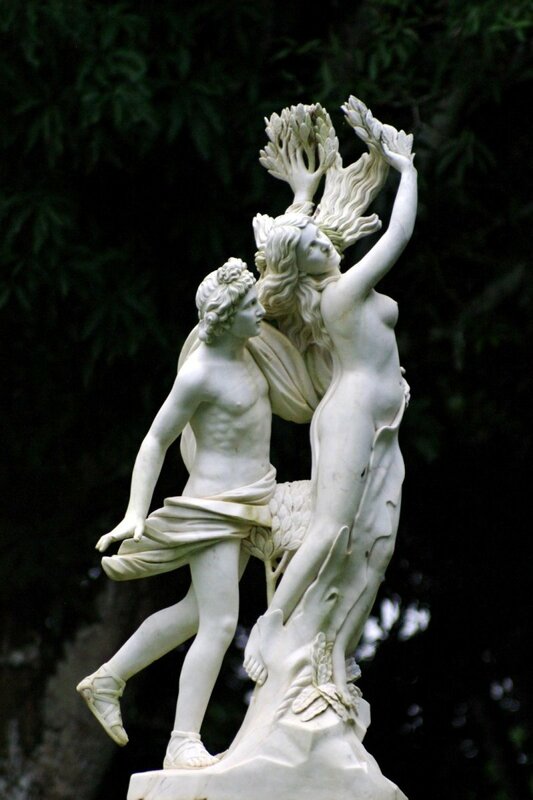 Though Artemis remained a virgin, her love for Orion concerned her brother Apollo. He feared that his sister's love for the hunter would cause her to forsake her oath. One day Apollo came upon Orion swimming in a stream. Only the head of the hunter was visible above the water, but at a distance was not recognizable. Apollo then went to his sister Artemis and bet that she could not hit a target from their current distance. Artemis, always ready to prove herself as accurate a shooter as her brother, struck Orion in the head with her arrow killing him. When she realized what she had done, she was devastated that her dear companion was dead by her own hand. 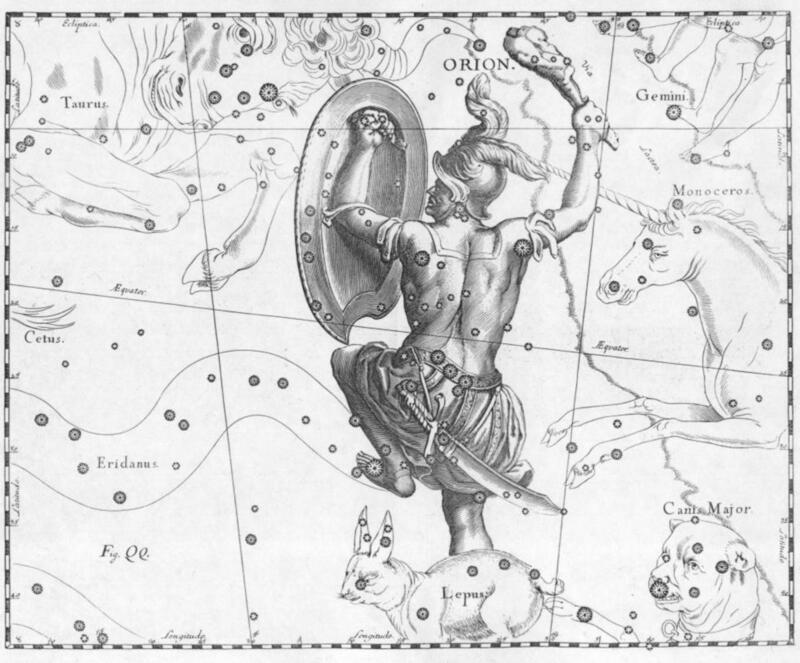 She then pleaded with her father Zeus to set Orion among the stars. Apollo, of course, had other siblings besides his sister Artemis, though she was the closest. The god quickly became aware of another son of Zeus. On the day Hermes was born, he slipped away from his mother Maia and stole the cattle of the sun god, his brother Apollo. Apollo knew that the newborn Hermes had to be the thief and went to the cave in Arcadia where Maia was living with her son. The older god charged in and accused his brother of being the thief, but Maia pleaded with him to look at her newborn still wrapped up and sleeping just where she left him. 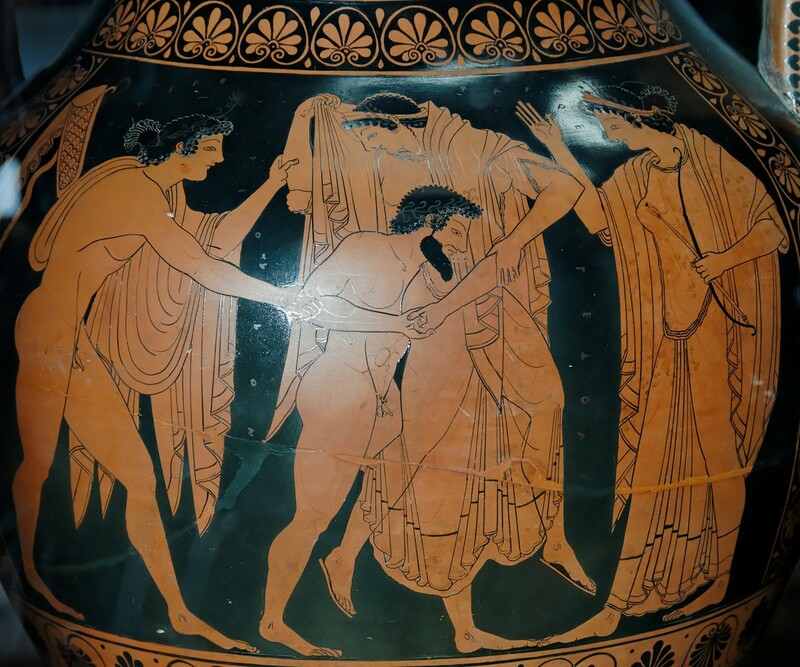 Apollo was not dissuaded and grabbed his little brother swiftly taking him to their father, Zeus. When Zeus met with the boys, Apollo told of his stolen cattle and that Hermes was the thief. Hermes, of course, protested his innocence pointing out that he was just born that morning, so how could he have possibly done the things his big brother was accusing him of doing. Zeus laughed then told Hermes that he had seen it all. He knew that Hermes was guilty and ordered the return of Apollo's cattle. Hermes, however had sat down and was playing music on the lyre he had created on his way to steal his brother's cattle. Apollo, upon hearing the glorious sound, inquired as to the type of instrument. Hermes showed the lyre to him and explained how he had created it. Apollo then made an offer. He would allow Hermes to keep the stolen cattle if Hermes would give him the musical instrument. Hermes agreed then pulled pieces of reeds, he had also collected during his trip, from his blankets and started making a reed pipe. Once he completed it, he started to play this instrument much to the delight of his brother, who in addition to being the sun god was the god of music. Now Apollo decided that he must have this instrument as well. He offered his little brother his shepherd's staff in exchange. Hermes wanted the gift of prophecy in addition to the staff, but Apollo knew Zeus would not permit him to share this with his brother. He offered Hermes his position as god of shepherds instead, which the infant god accepted. 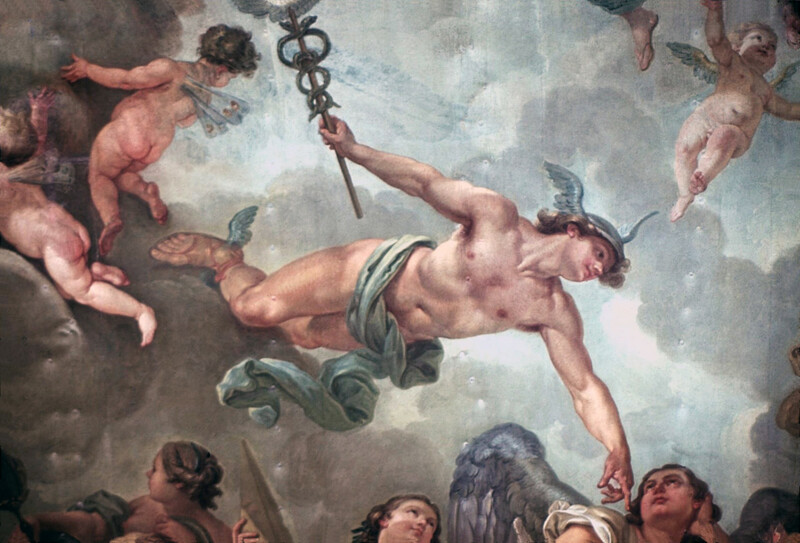 The shepherd's staff would become Hermes famed caduceus. Apollo, as the god of prophecy, archery, music, poetry, healing, plague and the sun, has many stories, and there were times when he got in trouble for his escapades. These include his attempt to help overthrow his father on Olympus by chaining Zeus to his bed. 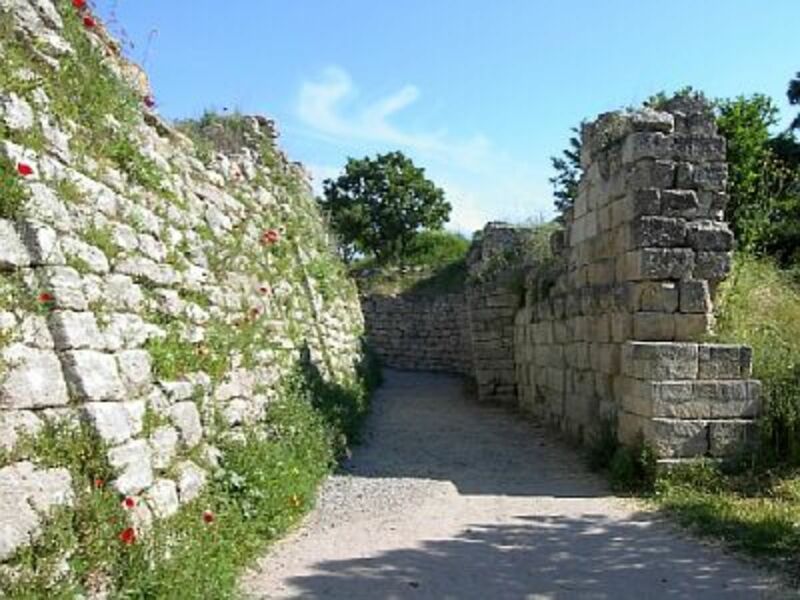 It was Hera's idea, but for Apollo's part he, along with his Uncle Poseidon, was forced to build the walls around Troy. When his son Asclepius was killed by one of his father's lightning bolts because his powers of medicine became so great he was able to return people from the dead, Apollo killed the Cyclopes who created his father's weapon. Apollo was sentenced to one year of servitude to King Admetus of Pherae. The most common stories about the god, by far however, involve his many failed love affairs. It seems that Apollo, whom all proclaim to be the most beautiful of the male gods, was never lucky at love. In one famed story, Apollo made fun of Eros, the god of love, telling him he was too little for a real bow and arrow. Eros, Roman Cupid, decided to show Apollo just how powerful his arrows could be. He struck the god of archery with an arrow to cause love. Apollo fell in love with the next girl he saw, Daphne. Eros had struck her with an arrow used to repel love, however. In her flight from Apollo, she begged the gods to let her escape his pursuit. She was turned into a laurel tree. In honor of her, he proclaimed the laurel wreath would forever be a symbol of victory. His love for Coronis failed when he learned she had taken a mortal lover while carrying the god's son, Asclepius. When a white crow flew to the god and told him that Coronis had been with a mortal man, he punished the crow by turning it and all of its kind to black. He then went crazy with anger, but still he could not bring himself to kill Coronis. His sister Artemis was all too willing to punish the girl for betraying her brother. Apollo came to his senses and remember his child but not until Coronis was placed upon a funeral pyre. 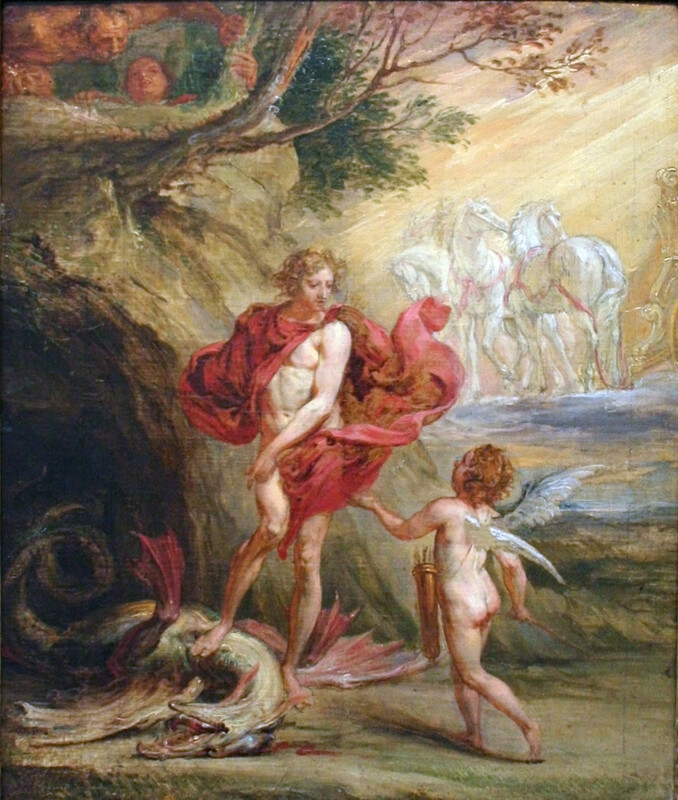 Apollo hoping to save his son, sent his brother Hermes to collect the baby. 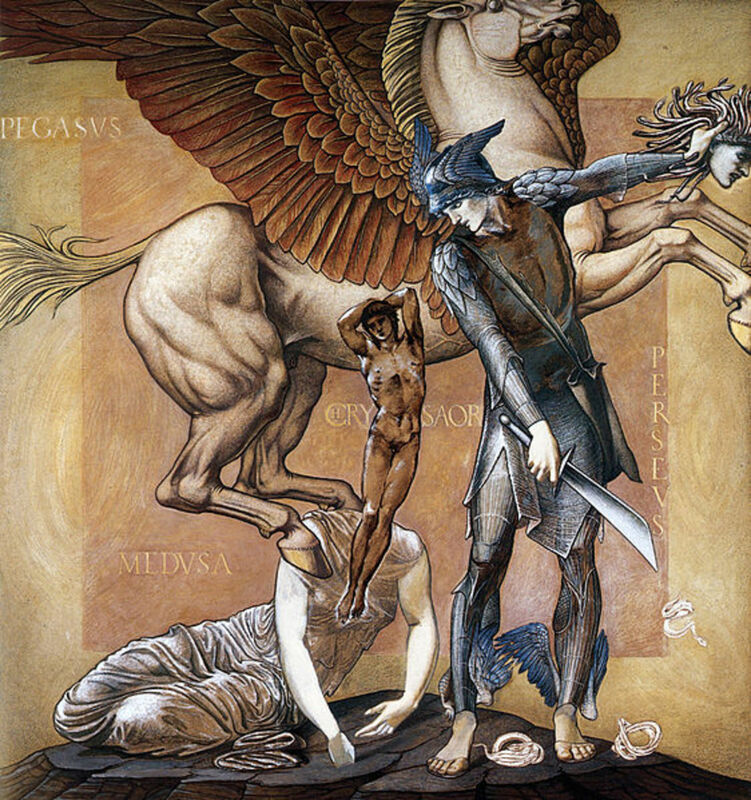 Hermes found Coronis's burning body and cut his brother's son from her womb. The child, Asclepius went on to become quite skilled at medicine and was made a god upon his death. When he tried to seduce Cassandra, a princess of Troy, she refused until he agreed to give her the gift of prophecy. An apparently desperate Apollo gave her the gift before she gave him her body. Once she had what she wanted, however, she sent him away without sleeping with him. He had no choice but to curse her so that no one would ever believe her prophecies. From that point on, Cassandra was thought to be insane by her fellow Trojans. Despite how true her prophecies proved to be, no one believed a thing she said. This doomed her father's city, Troy, to defeat against the Greeks as her warning about the Trojan Horse went unheeded. Her city's defeat lead to her own doom as she was raped on the altar of Athena's temple then murdered by the Greeks. His relationships with young boys did not fare any better. 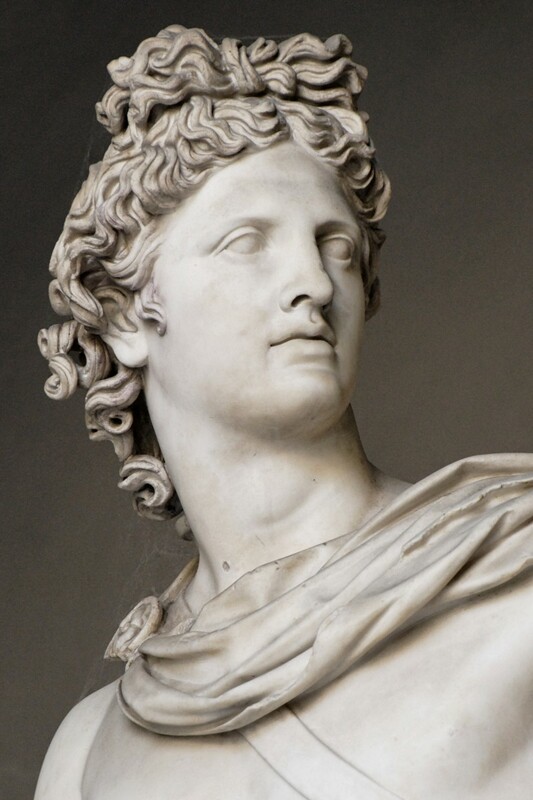 Out of jealousy for Apollo's love for Hyacinthus, Zephyrus, the west wind, blew a discus, thrown by Apollo, into the boy's head causing his death. 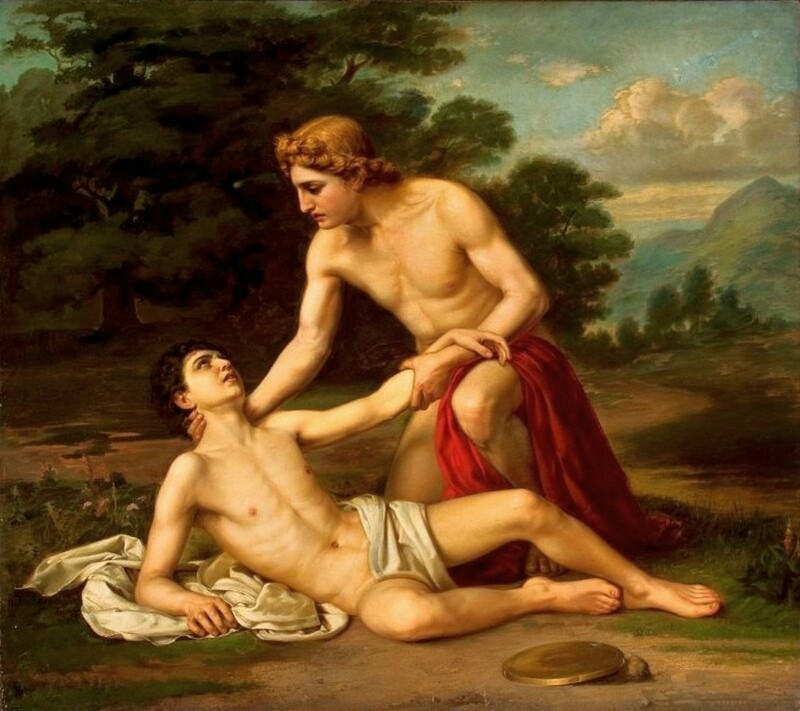 Apollo was so devastated he turned the boy into the hyacinth flower. The stories of Apollo tell us just how hard it is to be a god. With the power to control the world, it sometimes becomes too easy to overuse it, especially when trying to protect the people you love. Other times, all of your power is not enough to save the ones you care for the most. As a son, a brother and an Olympian, Apollo made mistakes in the name of love, and though he was handsome and powerful, he never managed to achieve a lasting love of his own. Nice compilation of the myths to create a full picture of Apollo. I hadn't realized that Apollo was a part of so many stories.